What about Radagast? He is more useful now with all that creatures or stlill expensive? Maybe wizard pipe have point with him? I didn try all those new cards yet….. It is pretty hard to loose with ents, but it is far less powerful than many other decks. This game is such a push over now it is getting ridiculous! Talk me through exactly how you're beating Nightmare Escape from Dol Guldur? Don't need to. Glaurung has a solo video on YouTube that people who don't know how to play can watch and the card pool is well more powerful now. He has one of normal mode. You show me a deck that's beating Nightmare more than 50% of the time and maybe I can take your, "This game is too easy" stuff seriously. Until then, you can say "don't need to" all you want, but I'm taking that as "I can't." hmm was sure he had a nightmare version up . Still regardless of your inability to understand the game to the point of beating this quest you should also take into account that this quest is well known as a anomaly. Picking one quest out of 30+ is not only unrepresentative but also petulant. • The way to beat this quest on nightmare solo was opened up with the mono faction heroes. LOL, man are you pompous! I've beaten it before, and even if I hadn't you are the LAST person I'd ever genuinely ask for help! Despite what you believe I don't think I've ever seen you be right about any complex issue or post some game breaking deck. And there's a myriad of quests that the best you're hoping to do is 50%. I have no idea why I'm feeding into you, because as usual, you talk big but back up exactly none of your talk. Game may be easy for couple of chosen ones, for others it's as challenging as they come. Hell, even infamous Encounter at Amon Din can give you a hard time once in a while. Absolutely. It's always going to be game to game too, since this is a card game. Card draw can go completely your way sometimes, but completely against you other times. To say "this game is too easy" sure makes it sound like someone is quickly glossing over their first and second round loses and focusing way too much on those few wins. The thing is that this quest is now trivial. What people are really saying when they find some of the older quests hard is that they are just not using top tier decks. Sure any game can have a bad draw, but we are talking about the "possibility" to beat something. Amon Din, should be like 80% plus if your using the "correct" decks. The thing is that this game is not a competitive one and there are a number of factor4s that lead to deck design witch is NOT based on power. Theme or tribes or the illusive "one deck to rule them all". Any quest can have a deck designed for that quest to trounce it with no problems, or very little. NM-EfGD is no exception, even with out the common house rule of a chosen captured rather than random. Is that quest still hard, sure it is.. but not unbeatable, and not with a super low near impossible win ratio like before and that win ratio is just going up and up and up and this game has insane powercreep in the player pool relative to the expansions. Amon Din is a perfect example. Look at the old threads people saying it is the hardest quest ever, now only a short time latter we have some respected community members saying they have won NM mode on their first try. Most people that have problems are either new players, bad players or for reasons of their own are not playing with a top tier deck or a deck designed just for that quest. This is why difficulty is so hard to judge. People play this game in so many different ways. Discussion would be so much more fruitful if you could just do, but from the beginning: acknowledge that "people play this game in so many different ways" rather than starting off your comments with choice phrases that "people who don't know how to play the game" and "inability to understand the game." Isn't that what I just said in the post above? Yes. He's making the point that you started the string of posts by saying so many of us were just bad at the game and THEN finally said we just play differently. Hmmm you still fighting here sometimes yes? Boored is right many times but he sound a rude for someone I know. For me is better real sometimes sound rode ans have a point then talk to much sweet and spend time for nothing. Anyway I found my way. I make my videos and dont need to fight anymore with anyone. I don't mind folks that have an opinion. I think what booored tried to say was that "Ents are too strong". I can read that between the lines. Boored is wrong many times but he sound a rude for someone I know. For me is better real sometimes sound rode ans have a point then talk to much sweet and spend time for nothing. Anyway I found my way. I make my videos and dont need to fight anymore with anyone. Lol, right, my fault for wanting the tiniest shred of respect while engaging in a debate, not his fault for being a jerk every third post he makes. What a joke. To me Ents are slow. I have seen several times the game plenty of orcs and one player putting into game ents exhausted without doing nothing while a lot of orcs attacking us and killing some characters and heroes. I dont like Ents, they remember me the slow eagle decks. I see where you're coming from, but to me there is one big difference between Eagles and Ents: the former are resource consuming and belong to only one sphere, while Ents are cheap and you can play them with any kind of deck. Ents don't eat all your money, so you can easily play some other cards while your Ents get ready for duty. So while Ents might be slow, it is not really a factor, because the player is having enough room /resources) to keep the encounter deck at bay. Ent's can't be played with any kind of deck due to their nature. 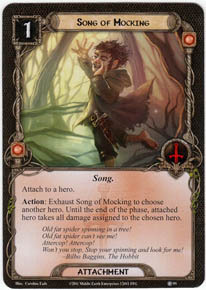 You're either play with lore/tactics deck (or Elrond deck) or a deck with a long setup.